Foundation purchases Anne Frank;s childhood home, where Frank family lived until forced to go into hiding by Nazi occupation. 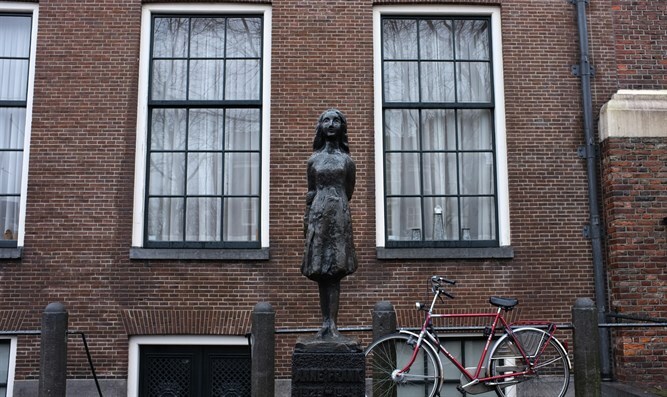 The foundation maintaining the Amsterdam house where Jewish diarist Anne Frank hid from Nazis during World War II said Thursday they had bought another property where her family lived in the 1930s. But the Anne Frank Stichting said it had no plans to use the "other home" as a museum, like the one in Amsterdam's famous canal belt which draws thousands of visitors every year. "It's important for the foundation that the home where Anne Frank lived in the 1930s remains intact and is looked after in a proper way," spokeswoman Annemarie Bekker said. "It has a very special character... the home situated at the Merwedeplein (square) is inextricably linked to Anne Frank," Bekker added. The home in southern Amsterdam formerly belonged to a housing corporation but it said it could no longer take responsibility for its upkeep. The Frank family lived in the modest brick building from 1934 until they went into hiding in 1944. Fuzzy black-and-white pictures show a smiling Anne looking from the home's window frame or sitting in a deck chair on its roof terrace. On July 6, 1942 the Franks went underground as the Nazis were rounding up Jewish families after invading The Netherlands in 1940. Anne Frank died at Bergen-Belsen in Germany in early 1945, aged 15, less than a year after her capture and just before the end of the war. Her diary, written during her time in hiding is one of the most moving testimonies of the war and among the most famous diaries of all time. More than 30 million copies have been sold, and numerous adaptations of the book have been made, including plays, television series and a film. The house has been restored to its original 1930s style. Since 2005 it had been let out to the Dutch Foundation for Literature, which uses it as a home for writers forced to flee their countries because of persecution. Currently Syrian writer Samer Alkadri and his family reside at the home, Bekker said.